Operating and maintenance manuals are an important part of any installation and contain information essential to the smooth running of any site or item of equipment, be it industrial, commercial or private sector. Co-ordination of O&M manuals produced by Others, including commenting and approval of the content of the manuals. Harper Tether Associates have produced a large number of operating and maintenance manuals – they are our “mainstay” product. We have written manuals for many and varied Clients and Projects, ranging from the Building Fabric at the Palace of Westminster to the mechanical and electrical services at various mobile phone data centre and from BMS installations to packaged air handling / chiller / boiler plant rooms. 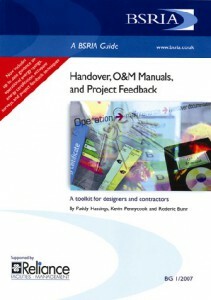 All of our manuals comply with BSRIA application guide 1/2007 “Handover, O&M Manuals and Project Feedback.